As one of the most convenient kitchen appliances, electric skillets offer so many functions in a very compact product. So, getting electric skillet can make your life a lot easier. But with the many brands available, how do you know which is the best electric skillet to buy? In this post, we will be going through the top 5 electric skillet reviews so that you can make the best decision based on your preferences. The skillets on the list are among the best in the cookware industry with a lot of positive reviews and satisfaction from users. Other than that, each of them offers unique features that make them different from other regular cookware. How to Choose the Right Electric Skillet? What shape should you get? Are you planning to deep-fry? Should You Buy an Electric Skillet? The Presto Electric Foldaway Skillet is one of the best electric skillet in the market and has a high number of positive reviews from users. It is also an Amazon’s best choice product. This Presto skillet has a high quality heavy cast aluminum base with 16 inches of cooking surface and made to be durable which you can use for many years. It has an effective non stick coating both inside and outside. This makes you use less oil in cooking which makes it a healthier and cost-efficient option. The non stick feature also makes it easier to clean compared to your regular pots or pans. The skillet has a built-in contoured spout that can help you work cleaner as your transfer liquids to another container when cooking. It can also be used as a spoon or spatula holder so that you can put the lid properly during cooking and serving. It comes with a tempered glass cover and stay-cool handles so you can use it as a buffet server. The design of the skillet makes it more efficient to use than a range burner or oven, and it takes up less space as well. This makes it great to use for those with limited storage space, and is equally great for those who have. The temperature knob let you easily control the heat for your desired cooking temperature up to 400F. Whether you are stir-frying or searing, this precise heat electric skillet can get the job done well regardless. 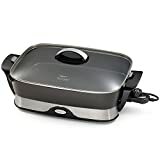 This is considered an electric foldaway skillet because it is easy to store with its fold-down handles and detachable base. It is also dishwasher safe with the removal of the temperature control. This is a great buy which will make your cooking and clean-up a breeze. The De’Longhi BG45 Electric Skillet is another great electric skillet with notable features. It has a secured tempered glass lid which helps improve cooking to keep your food juicy. Besides that, it has the best quality of die cast aluminum for its body which is a great material for cooking because it last long and will still look great after years of use. Most cookware covers come with a lid that has a steam vent but this De’Longhi skillet comes with adjustable steam vent holes that allows you to choose how much steam you want to release from cooking. This prevents getting burns from steam upon lifting up the lid when cooking. The skillet has a non-stick base that effectively keeps your food from sticking to the surface unlike other non-stick pans. It has a large cooking surface which makes it efficient for cooking large portions of food or serving tray for a party. This has an embedded heating element that ensures the even distribution of heat throughout the skillet. Unlike cooking on a gas or electric range that keeps the heat at the center, this skillet is great to evenly cook your food. Since the heat is properly distributed, it helps cook your food at the shortest time possible. With an adjustable thermostat that allows you to control the temperature, you can cook your food perfectly and avoid getting burns. It comes with cool-touch handles for easy handling. You can also safely and conveniently clean it in the dishwasher by removing the detachable temperature control. A standard 1-year limited warranty come with every purchase of De'Longhi electric skillet. As one of the most trusted brands in cookware, the Hamilton Beach Deep Dish Ceramic Skillet is another one you shouldn’t miss. The Durathon ceramic non-stick coating is their unique feature because aside from lasting long, it doesn’t crack or peel easily unlike other traditional non-stick coatings. Additionally, this Durathon coated skillet is PTFE and PFOA free, making it one of the healthiest and safest non-stick skillets in the market. This skillet has more depth than other skillets and comes in 3-inches deep of cooking space. Its non-toxicity and depth, makes this product the best electric skillet for frying chicken and other food. It is deep enough to submerge food for frying and its non-toxic materials wouldn’t leech dangerous chemicals despite of the high temperature. It has an adjustable temperature of up to 400 ºF, allowing you to work with different kinds of cooking like sautéing, stir-frying, simmering, braising or boiling with precise heat. The warm setting allows you to use it as a food server for a buffet setting, so you have freshly cooked food without getting cold. With its high temperature, the handles will remain cool to the touch and allows you to hold it without the need for cooking gloves. After cooking, serving, and the removal of the temperature control, cleanup is very easy and convenient because it is also dishwasher safe. Hamilton Beach definitely offers one of the best electric skillet and is unique with the Durathon and 3-inch deep features. 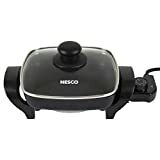 The Nesco Electric Skillet is a very compact skillet which is 8-inch size and also comes in 12-inch model too. But despite the limited cooking surface, you can still comfortably roast, fry, steam, or bake with its deep interior. This is also ideal for homes with limited space and storage area or students that live in dorms. The skillet is powered with 1800 watts and has a thermostat temperature control with a pilot light. It is easy to read so you can easily adjust the temperature while cooking compared to other controls. This prevents your food from burning and allows you to have perfectly cooked meals. It comes with a die cast aluminum pan with a non-stick cooking surface. Just like other electric skillets, its high-quality material makes it last long throughout years of use. The non-stick feature also lets you cook healthier meals without having to use too much oil. This material also makes it easy to clean that lets you enjoy fresh and clean food with every use. However, the lid is only dishwasher save but not that pan. Only use soap and water to wash the pan and no metal scrub to prevent scratching out the non-stick coat. It has a sturdy tempered glass lid that won’t easily break. The safety vent on its lid works effectively in releasing steam safely while cooking. This avoids the steam from building up inside and causing steam burns. Overall, this is a very useful skillet if you want something compact. The size is perfect for small homes but doesn’t limit the amount of cooking that you can do. The Zojirushi d’Expert electric skillet is the only round-shaped skillet on our list of electric skillet reviews and the round shape skillet is especially great for stir frying. It is a multifunctional kitchen appliance that allows you versatility in cooking a variety of food. The d’Expert comes with 2 cooking pans which are very useful for different types of cooking like stir-frying or sautéing. It has a deep dish inner pan for making soups or fondue. It even has steaming plate for steaming food. Lastly, it includes a titanium coated ceramic non-stick flat plate for grilling. It’s powered with 1,350 watts and has an adjustable temperature setting from 176F to keep your food warm or heat your food up to 480F. This is a wonderful feature that allows you to cook your food at your own preferred temperature. The handles on its sides are stay-cool so that you can hold the skillet while stirring or cooking your food. It also keeps your hands from getting burns which usually happens when you use traditional pots on cooking ranges. This skillet has a see-through tempered glass lid that allows you to easily monitor your food while cooking and minimizes lifting up the lid. With the different features that it can offer, it comes as an all-in-one package for a very affordable price. It is a very convenient product that allows you to cook in many ways. As a bonus, the product comes with suggested recipes and the instruction manual is in English, Traditional Chinese, Korean and Japanese. The product also comes with a 1-year limited warranty. An electric skillet is a kitchen appliance that combines heat and a pan into one so that you don’t have to cook food on a stove. The skillet usually comes with an electric heating element which you can control with its temperature settings. Some skillets are capable of frying food and most come with non-stick features. An electric skillet works great for people with space constraint. Usually, an electric or gas stove will take up a considerable big amount of space in the kitchen. However, an electric skillet can be set up on top of a kitchen top; plug in the electric outlet and you ready to start cooking. Knowing the usual quantity of food you need to cook can easily help to determine the skillet size you need. There are skillets that are very compact with an 8-inch size while there is some 20 inch electric skillet for bigger groups of people. If you usually work with a single serving portion of food, then a small one will be perfect, but if you’re planning to use it for parties; definitely go with a large skillet. Just like pots and pans, skillets also come in different shapes. The most common are either round or square. The type of cooking you’ll do will let you decide what kind of shape to get. A square or rectangular skillet is perfect for searing meat, while a round skillet is great for stir-frying and making soups. Some electric skillets are capable of frying food, and if you’re considering this, then you should get a deep set pan with temperatures that can reach 450 ºF. Most electric skillets can reach this temperature but not all have a deep dish feature. The deep dish can hold more cooking oil for deep fry with spilling the oil out from the pan. Like mentioned earlier, if you have limited space for a stove and cookware, then going for an electric skillet is an excellent option. With its versatility and functionality, limited space will not keep you from making delicious meals. So, yes, we would highly recommend you to buy an electric skillet but be sure to read our reviews first and select the best one that suits you. Most electric skillets have a non-stick coating that is only semi-permanent. That means, it can come off if when scratched with something abrasive or sharp and will ruin the non-stick feature. When using an electric skillet, always keep in mind to use wooden utensils instead of metal. This will prevent the non-stick coating from getting scratched and coming off. Click here to find more caring tips for your electric skillet. If you are considering buying the best electric skillet, all our options are worth buying. They have many different features that function in many ways. They allow you to cook a variety of food. However, carefully considering all the features you need especially the size is crucial so that you can choose the one that best suits your cooking and the kitchen space. Most electric skillets have the same features and because there are many options available, you should choose one at least have the heat-resistant handles, functional steam vents, sturdy tempered lids, and non-stick coating. Having these features are the most basic of a good electric skillet.